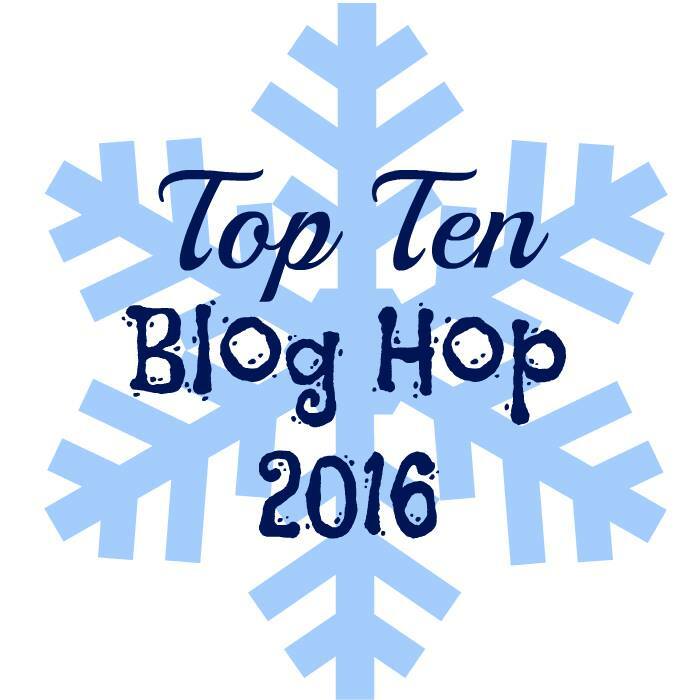 Hello and welcome to the 2016 Top 10 Blog Hop! 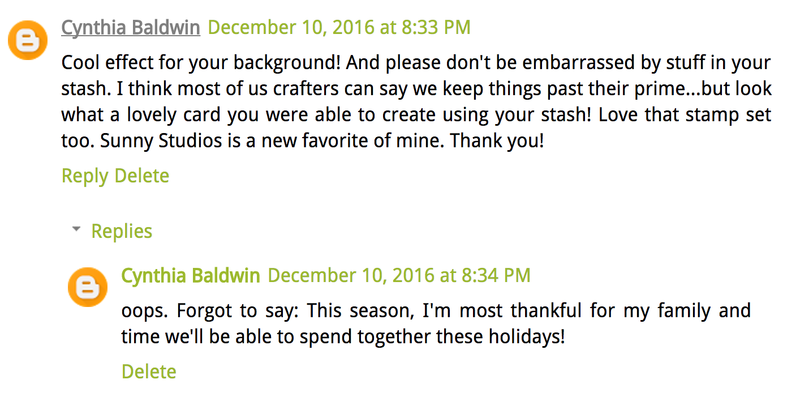 With the end of the year almost here, I'm participating with a group of my crafty friends to share our top 10 favorite projects from 2016. This year has been full of change with regards to my creative outlet. Early last year, I became more interested in card making and started doing some stamping and coloring. As the year has progressed, I've done less and less scrapbooking and more card making. I never thought I would stop scrapbooking and maybe I'll pick it up again, but for now, I'm really enjoying card making and learning more about using different mediums to design and create with. After you take a peek at all my favorite projects, make sure you check out the end of the post for all the blog hop details and for the blog candy! This past year I was blessed to be asked to join the Card Maker Magazine Blog Design Team. This opportunity sealed the deal for me with card making! It really helped me realize just how much I enjoy the process involved with making a card. 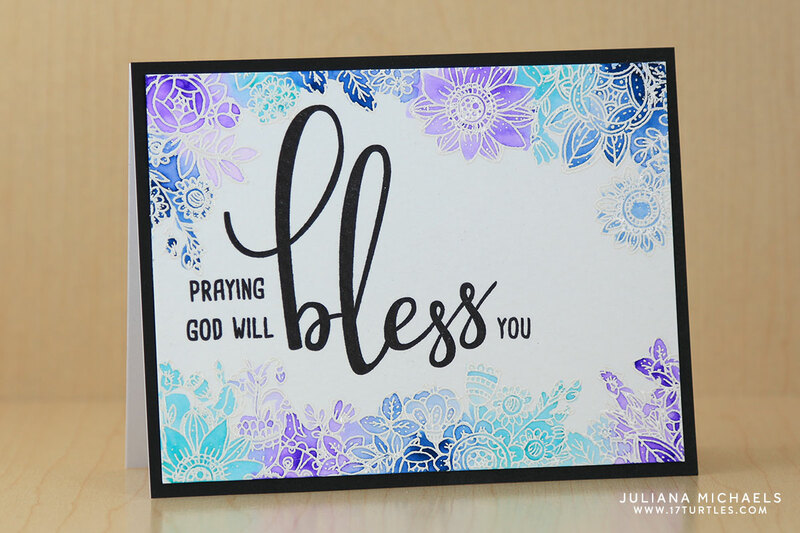 I had the opportunity to create and share a variety of card making technique and paper craft projects on their blog and to participate in several blog hops with new to me companies such as Impression Obsession and Taylored Expressions. Stamping With The Back Of Your Clear Stamps - This is a card I made for our Impression Obsession Blog Hop where I shared how to use the back of your clear stamps to create a watercolor effect. In February I taught another online class for Big Picture Classes called Stretch Your Punches. This class shows you how to get the most out of your paper punches by creating four different layouts, each featuring a different technique. 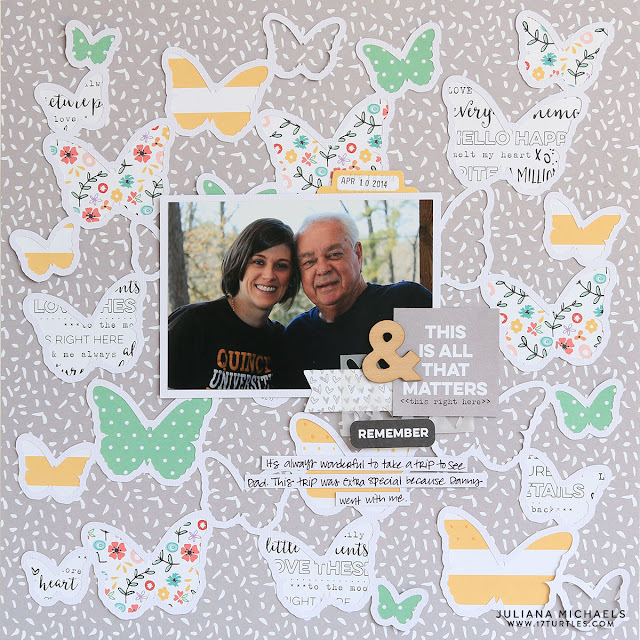 I share tips and tricks along the way that help you look at your punches in new ways and allow you to customize your scrapbook pages even more. During 2016, I continued to create and share free digital cut files here on my blog. One of my favorites was Butterfly Frenzy Free Digital Cut File. This post also included a tutorial on how to back your die cuts with patterned paper. Another favorite of mine was the Chevron Background. 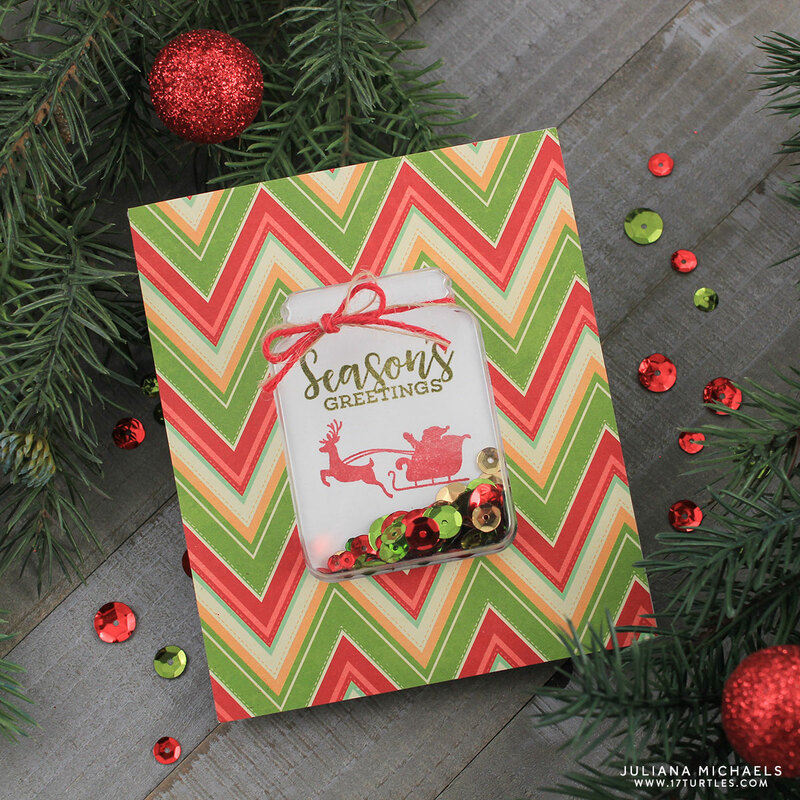 This one is a simple overlay that looks great with a piece of patterned paper layered behind it. And as always, if you are looking for more free cut files, make sure to check out my Digital Cut Files Page. As for design teams, I was blessed to continue designing for Therm O Web using their fabulous adhesives and Deco Foil to create a variety of paper crafts. 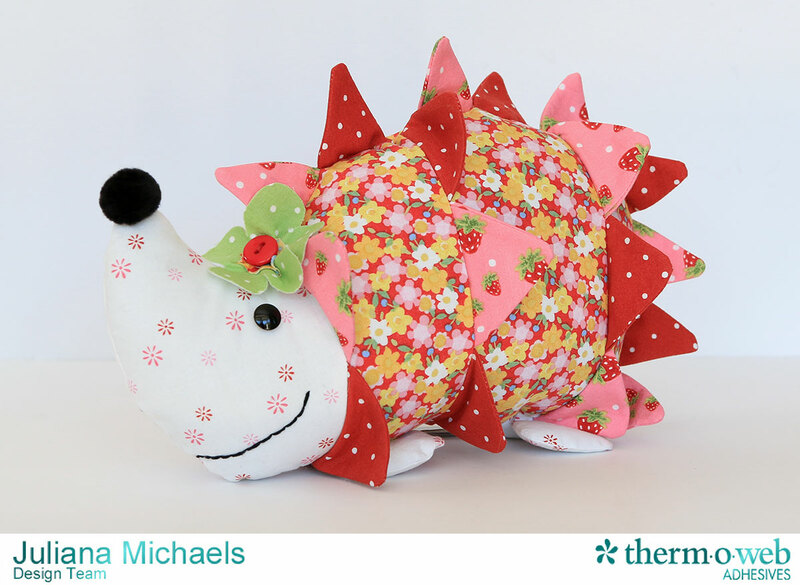 I even made a couple of fabric projects this year including this cute hedgehog pattern I created with Heat N Bond and Jennifer Jangles Strawberry Festival Fabric. Another fun opportunity I've had this past year was to guest design for Sunny Studio Stamps. I adore their adorable stamp designs and I had a blast creating cards for their spring, summer, fall and winter releases. 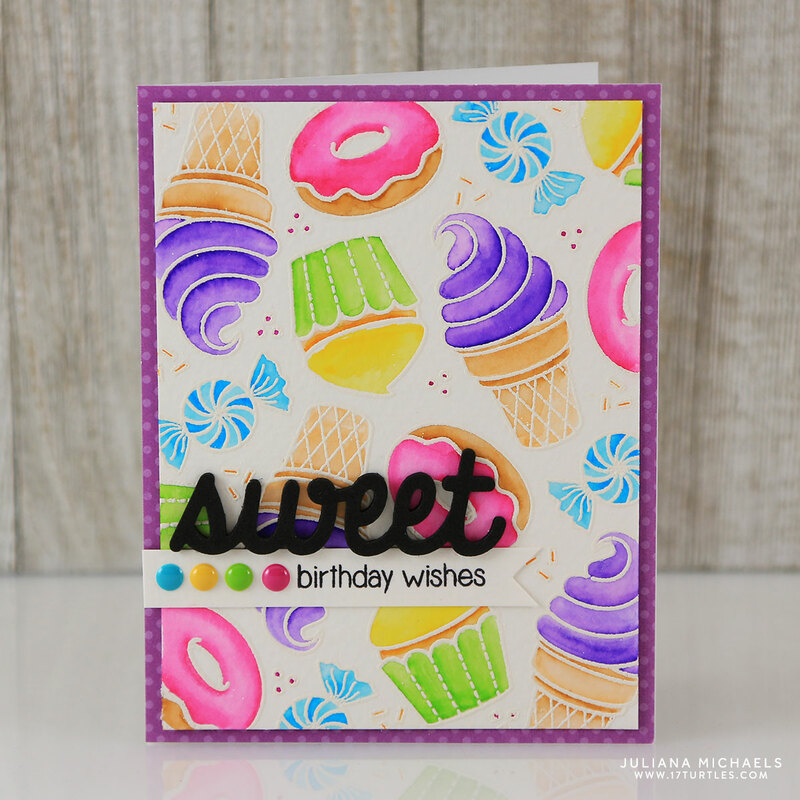 This is one of the cards I created using their Sweet Shoppe stamp set for their Spring release. And, I'm pleased to share that I'll be guesting for them for their Spring 2017 release in March! As many of you know, I love Halloween. 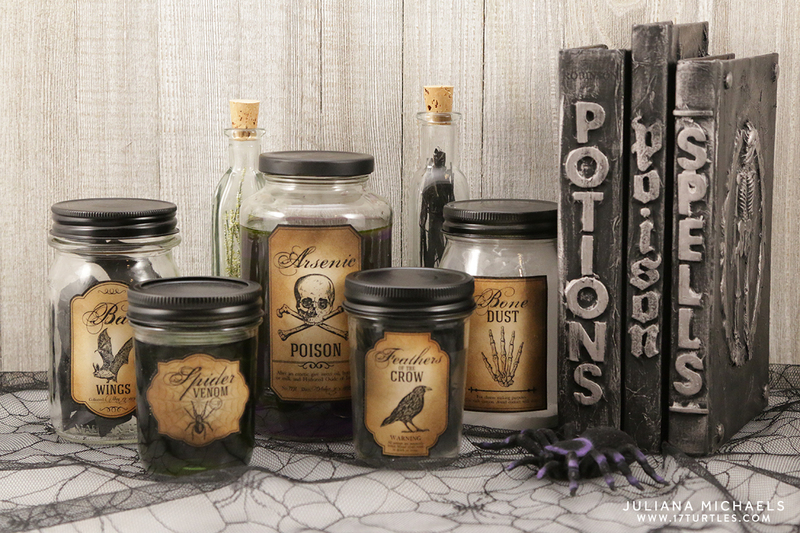 This year, I created some fun free Halloween Apothecary Labels. I used them to recycle some glass jars to create a set of Apothecary Bottles to decorate my house this past Halloween. 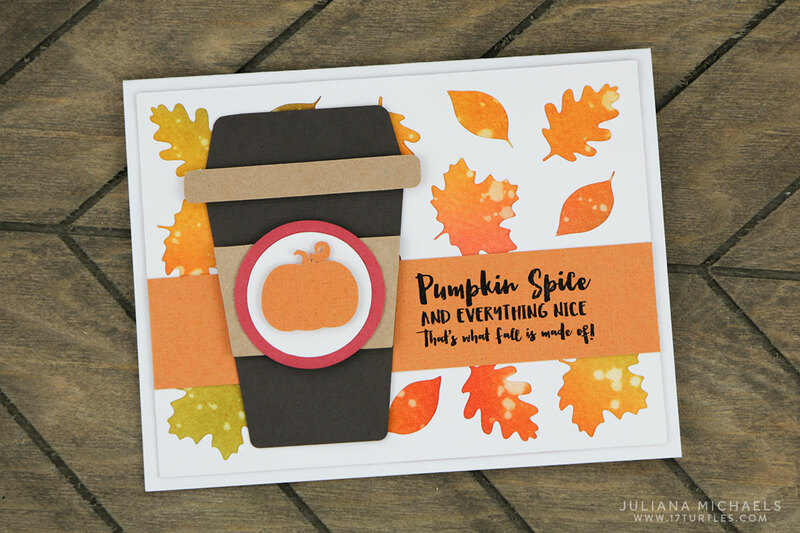 In 2015, I started working my dream job as a graphic designer for Jillibean Soup. I've continued working for them this year and it has been a blast working along side the Jillibean team to create a lot of fun new products this past year including a new line of Holiday Shape Shakers. I used these to create a few Christmas shaker cards this year. I mean, who doesn't love a shaker card?! Last, but not least, I created quite a few crafty projects that weren't paper related. 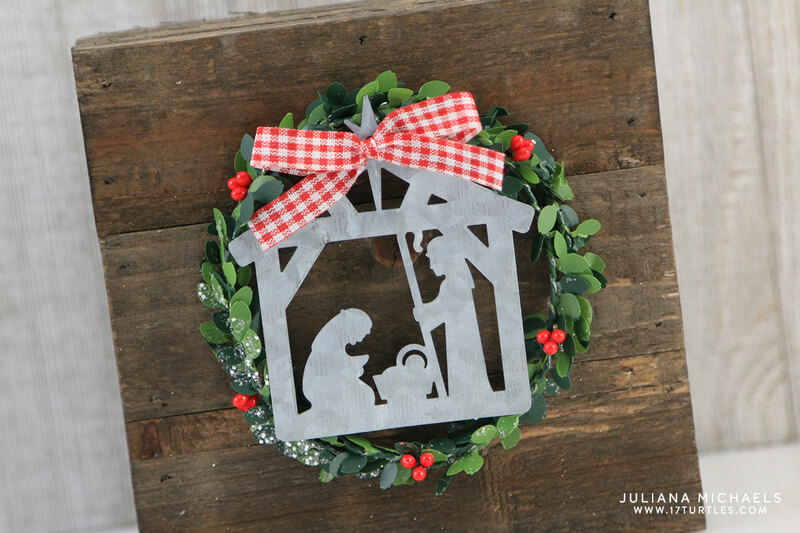 I have always enjoyed creating holiday themed projects such as this Wood Plank Christmas Nativity Decoration I made as a Christmas gift for friends and family. Now, that you've made it to the end, it's time for the giveaway! a $25 Gift Certificate to the online store of your choosing! If you would like an extra chance to win, follow me on Instagram and leave a comment to let me know you did that or if you are already following me. To be entered to win, all you have to do is leave a comment below by 11:59 pm CST on January 2. Now, I invite you to visit the rest of my crafty friends for the 2016 Top 10 Blog Hop. I know many of them are having giveaways and such as well. Happy hopping and thank you so much for stopping by! 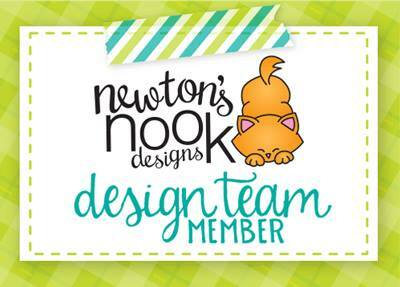 I'm so super excited today to share with you that I'm one of the new members of the Newton's Nook Design Team! As many of you know, I started my journey into stamping and card making this past year and it has been so much fun. I've truly fallen in love with the stamping, inking and coloring that goes along with it. 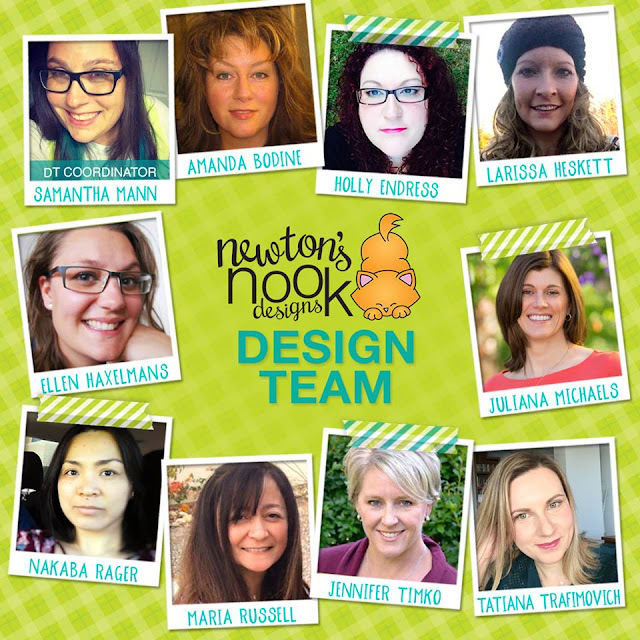 I truly feel blessed to have been asked to join the Newton's Nook design team and I'm looking forward to creating, sharing and inspiring you as I create with their awesome stamps and dies in the coming year. 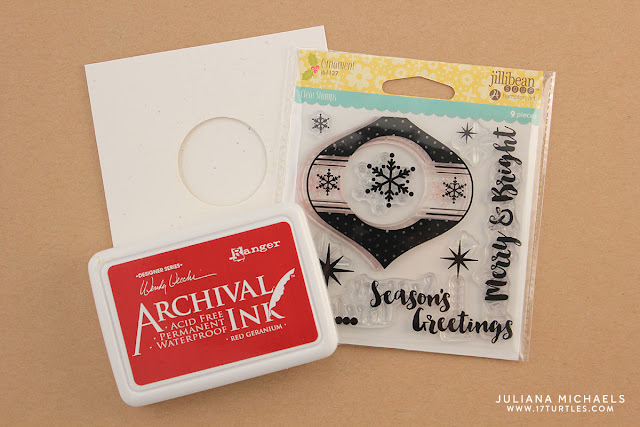 To go along with this awesome announcement, I made a card to share with you using the adorable Newton's Nook Sweater Weather stamp and die set. 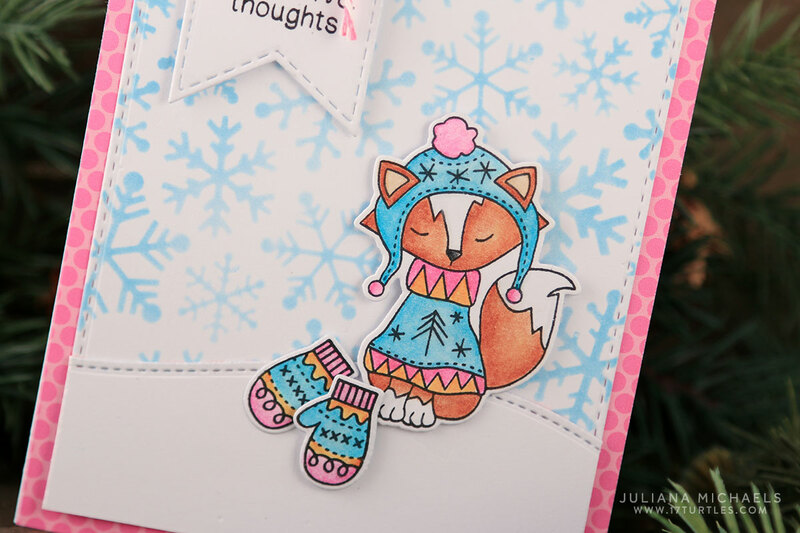 I stamped the adorable fox and mittens with Versafine Pigment Ink in Onyx Black. I then colored it in using Prismacolor Colored Pencils and blended them using Gamsol. The background was created using an Echo Park stencil and Tumbled Glass Distress Ink. Of course, I'm not alone in joining their team. Here are all of the talented ladies I'll be creating with on the Newton's Nook Design Team. I invite you to visit their blogs to get to know them a bit better and start following them on social media if you don't already. Thank you all so much for joining me to share this exciting news! I'm sending all of you big hugs and wishing all of you a very Merry Christmas! Congratulations to Cynthia, the winner of the blog candy from the Winter Coffee Lovers Blog Hop! I don't have a way to get a hold of you to get your address, so I do hope you or someone who knows you see this post. Thank you to everyone who visited during the hop and for all of your sweet comments. It's amazing how much this hop continues to grow. I can't wait until the next one. How about you? Hello friends! 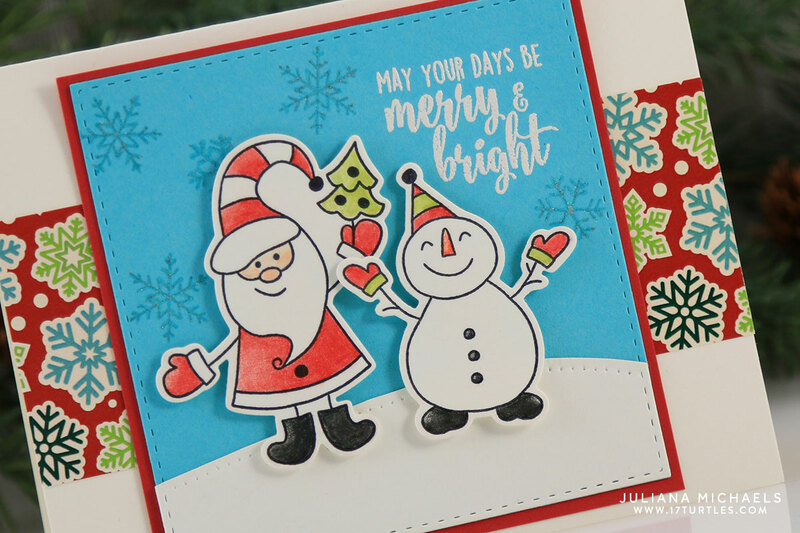 I'm so excited to share that I'm guesting over on the Sunny Studio Stamps blog again today with four cards I created using stamps and dies from their Winter 2016 release. As I was creating my cards, I decided to create one extra one to share with you here today. 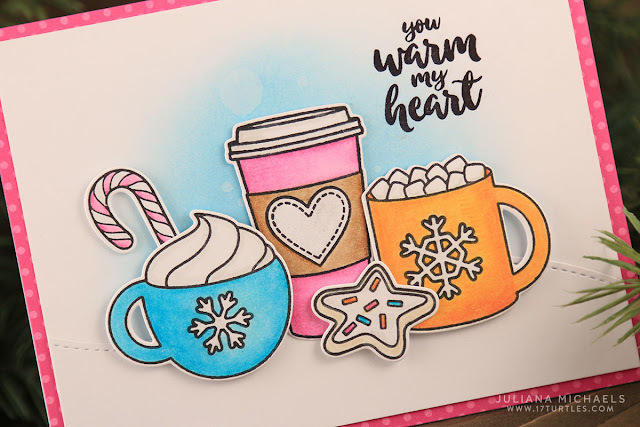 For this card, I used the Mug Hugs Stamp Set. Since I'm a bit of a coffee lover, this one has quickly become one of my favorites because of all the cute little cups and mugs. I stamped each image using Versafine Pigment Ink in Onyx Black. I then colored each image using my new 150 set of Prismacolor Colored Pencils. I was lucky to win a Amazon gift certificate recently and with that and an awesome sale, I was able to get the set. It's really quite fun to say that I have all of the colors! To create the smooth look with the colored pencils, I used Gamsol, which is oderless mineral spirits and stump blending tools. 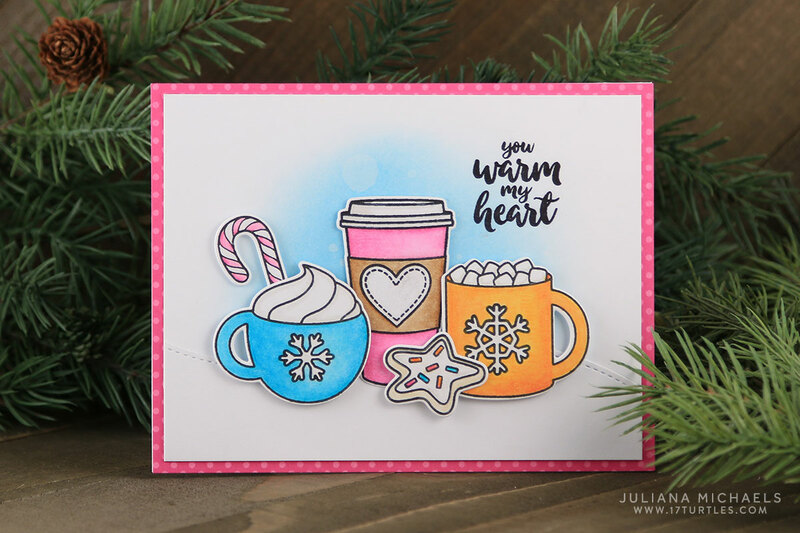 After, I finished coloring the images, I die cut them and then added a bit of Zig Wink of Stella Clear Glitter to the white area on the snowflakes, heart, candy cane and cookie. You can't really see it in the photos, but it add such a wonderful touch of shimmer and shine to them. I created the background, by applying Distress Ink in Tumbled Glass to my cardstock using a ink blending tool. Next, I splattered a little bit of water onto the ink using a paint brush. I then dried this with a paper towel to remove a bit of the ink and create a fun, snowy background. To complete the card, I stamped the sentiment and then adhered the die cuts to my card front using some double sided foam tape to give them a little dimension. 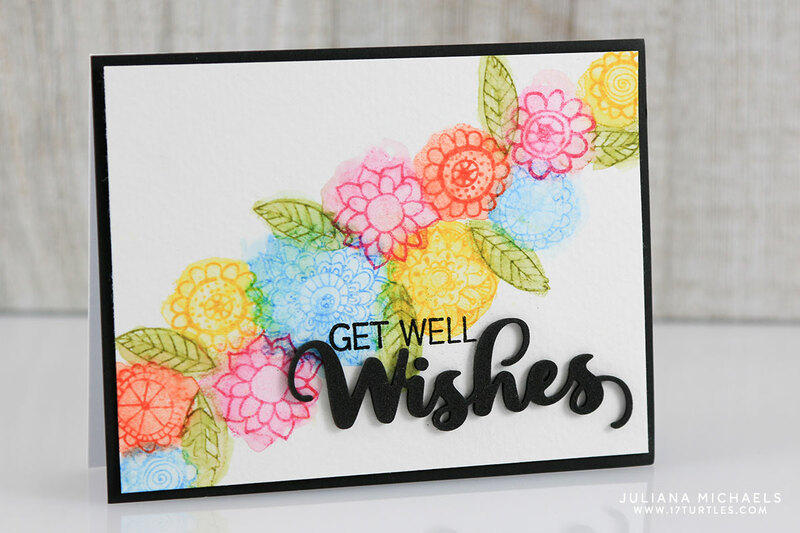 I sure hope you'll stop on over and visit the Sunny Studio blog to see the other cards I created. 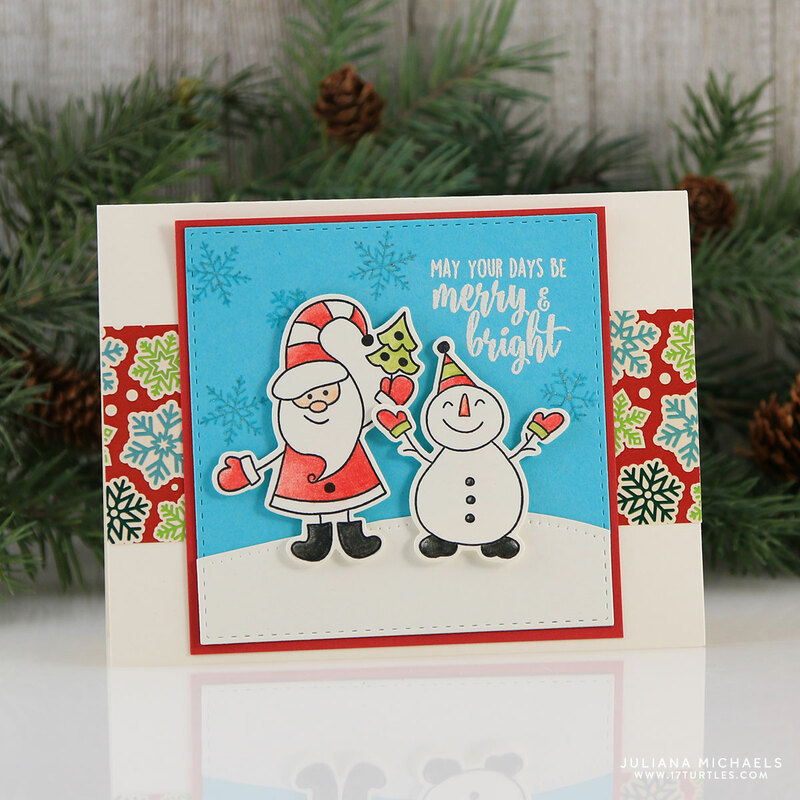 Here is a little peek at a shaker card I created using the Gleeful Reindeer stamp set. Affiliate Links are used because these are products I love and want to share about them with you. If you make a purchase after clicking, this means I'll receive a small commission at no extra cost to you. Thanks so much for your support! Welcome and thanks for stopping by today. 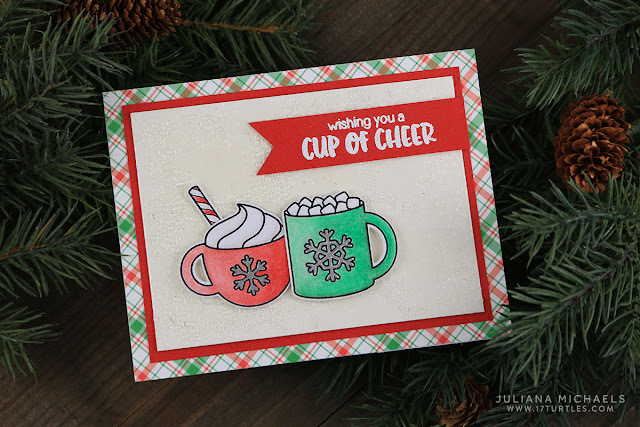 I'm so happy to be playing along with the 2016 Winter Coffee Lovers Blog Hop! The hop started today, Friday, December 9th and will run through Friday, December 16th. The theme for this hop is winter/holiday and this inspired me to create a fun coffee themed card with a cracked ice background. For more details about the hop and a chance to win a special little gift from me, check out the bottom of this post. So what is a cracked ice background you ask? I'm going to share with you what it is. This technique uses something from my stash. This stuff has been sitting there for several years and I'm not going to say just how many. To achieve this look take a piece of cardstock, cut to your desired size, and ink the entire surface with Versamark Embossing Ink. 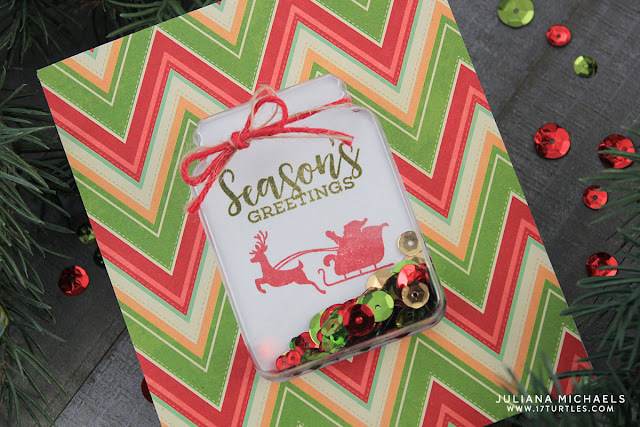 Sprinkle the surface with clear UTEE (Ultra Thick Embossing Enamel) and heat with a heat gun. To get the fun bumpy surface, try to avoid heating it until it is fully melted. Apply another layer of Ink, sprinkle on more UTEE and heat with heat gun. Again try to avoid over heating or completely melting the UTEE. Repeat this process one more time. Once the entire piece is completely cooled, gently bend the paper and you will see that the UTEE will start to crack. What a fun effect and one I haven't done in ages. It's perfect for creating a winter themed background, don't you think?! Once my background was completed, I adhered a couple of cute mugs from the Mug Hugs stamp set by Sunny Studio. I colored them with my Prismacolor pencils and added a touch of shimmer to the snowflakes using a Silver Metallic Gelly Roll pen. For the sentiment, I again used the Mug Hugs stamp set and embossed it with white embossing powder. I just love the cool effect and texture this technique adds to my card. I hope you enjoyed learning about this the Cracked Ice technique and that you'll give it a try on your next project! To play along all you have to do is create a new winter/holiday coffee, tea and/or cocoa themed project and then head over over to the Coffee Loving Cardmakers Blog to link it up. While you are there, make sure to check out all of the details. There are loads of great prizes being given away for playing along. Anyone is welcome to link up any time between Friday, December 9th at 6 am pacific and Friday, December 16th @ 11:59 pm pacific. There are no limits to the number of entries - in fact, the more the merrier! By linking up your project, you become eligible to win a prize from one the amazing Super Sponsors! I hope you'll play along and thanks so much for stopping by today! If you share your project on social media, make sure to tag it with #winter2016clh! 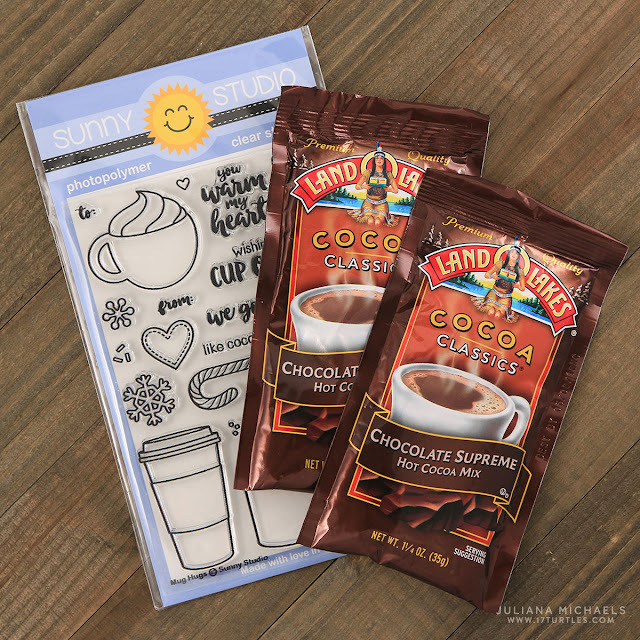 And now, as a special Merry Christmas gift to you, I'm giving away a Sunny Studio Mug Hugs Stamp Set to one lucky person who leaves a comment below telling me what you are most thankful for this holiday season. Make sure to leave a way for me to contact you if you're the winner. Commenting will be open until December 16th at 11:59 EST. Merry Christmas and Happy Holidays! Supplies - Affiliate Links are used because these are products I love and want to share about them with you. If you make a purchase after clicking, this means I'll receive a small commission at no extra cost to you. This extra money helps me do giveaways like the one for this hop. Thanks so much for your support! This easy to make Wood Plank Christmas Nativity Decoration is perfect to use for decorating your own home or giving as a gift! 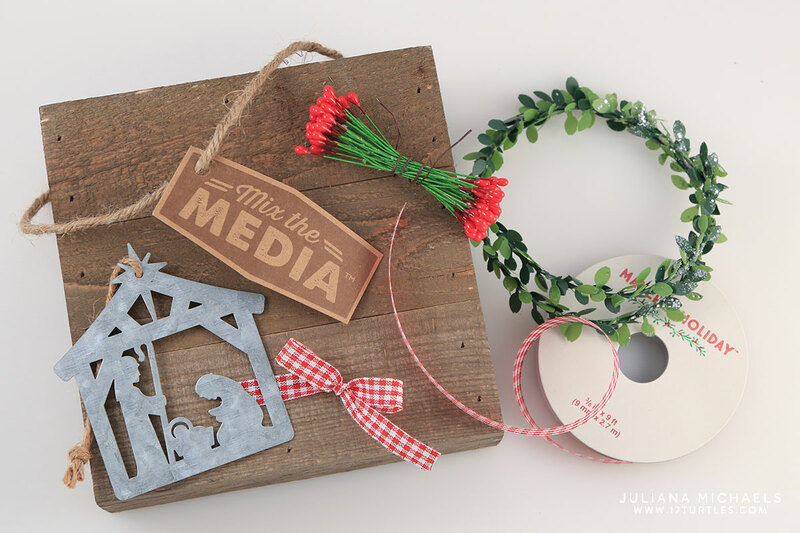 Lately, I've been getting more into the farmhouse decor trend and this year some of my Christmas decorations and craft projects are taking on this style. With Christmas coming soon, I've been crafting up a storm creating gifts for my family and friends. 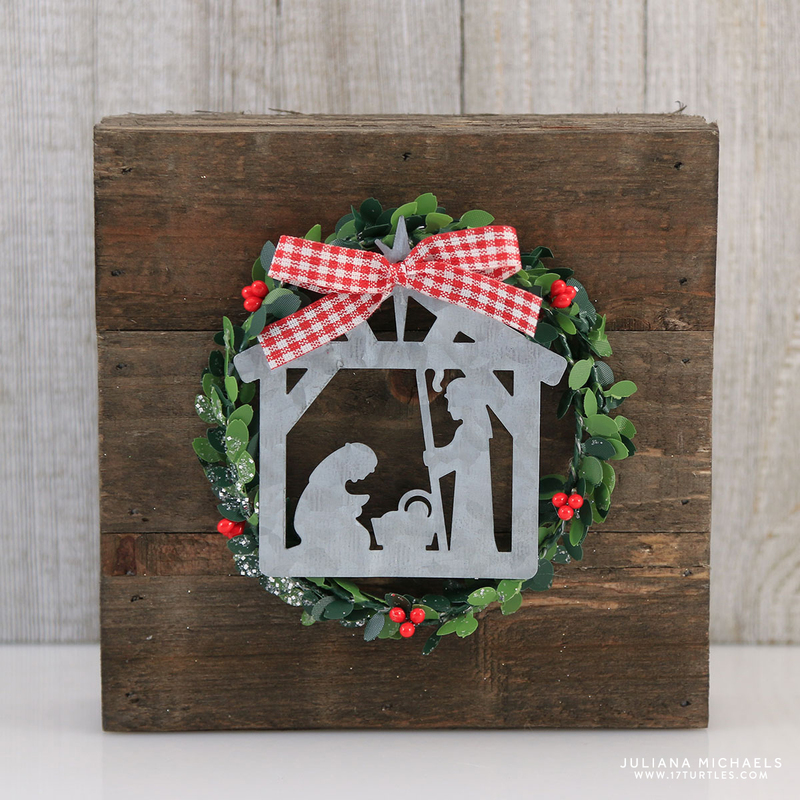 One of the projects I recently created for some of my crafty friends is this Wood Plank Christmas Nativity Decoration. If you are unable to locate the Nativity ornament I used, feel free to substitute it with any Christmas themed die cut shape made from metal or wood. You could paint the wood with metallic paint. 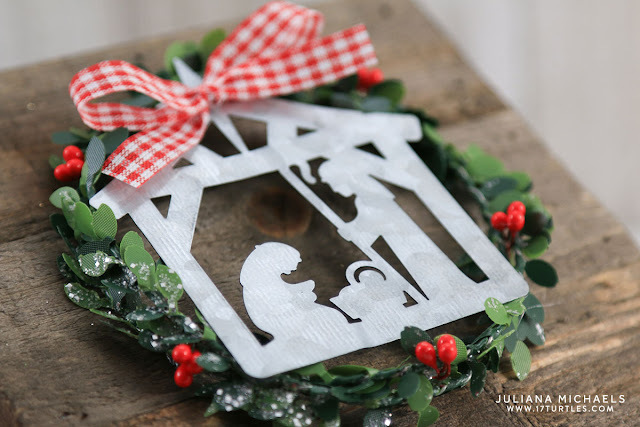 Another option would be to use a die cut or an electronic cutting machine, such as a Silhouette Cameo, to cut out a Nativity from chipboard or paper. Begin by making a wreath from the garland, using wire cutters to cut it. 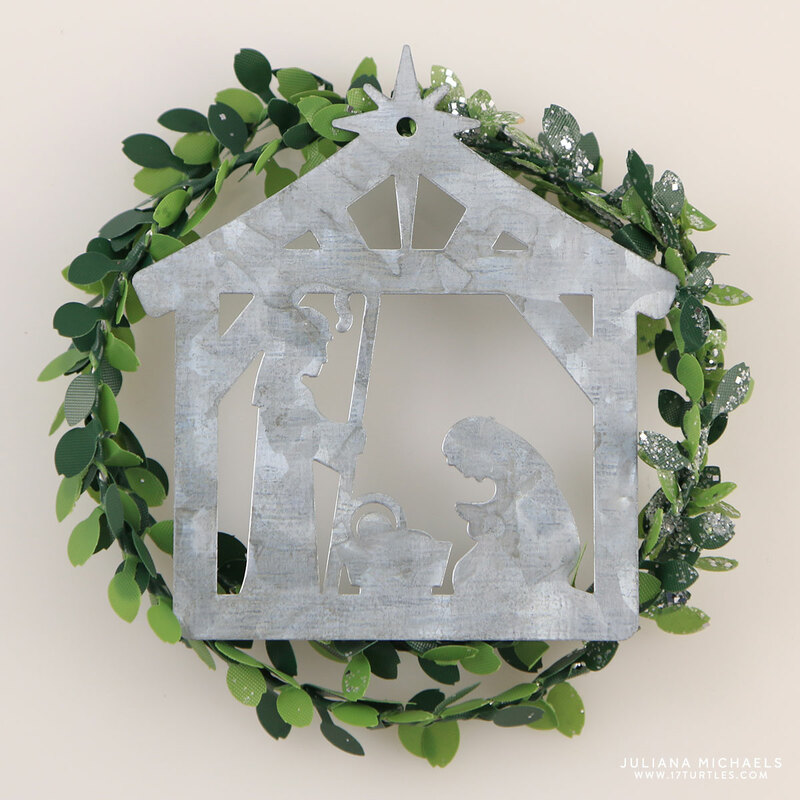 Size it so the Galvanized Nativity Ornament, or whatever piece you use, fits on top of it and touches the wreath in 2-3 places. 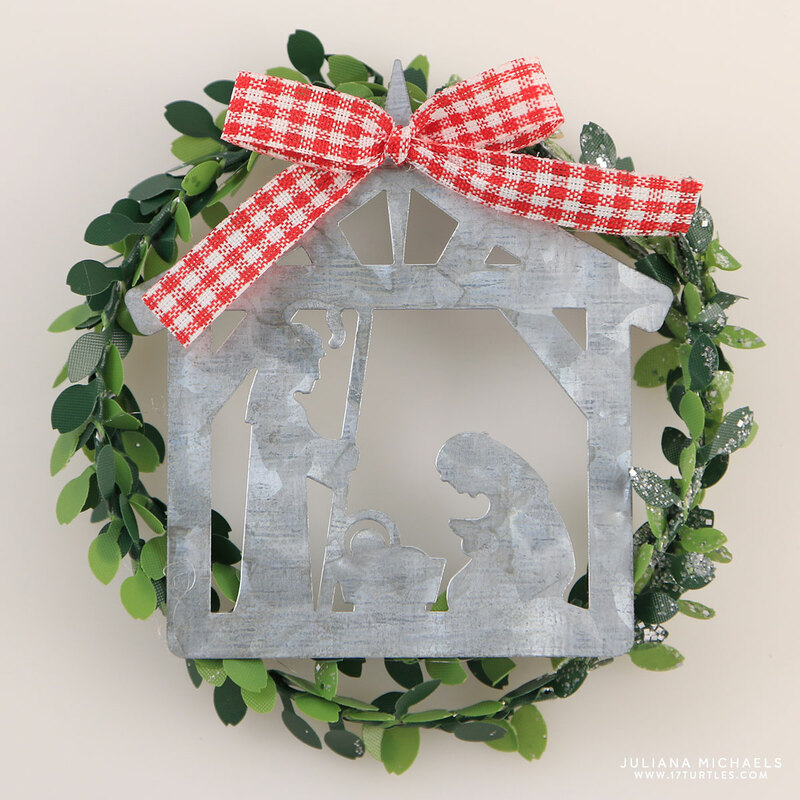 Use a hot glue gun to attach the ornament to the wreath. Cut a length of ribbon, tie it in a bow and hot glue it to the top of the ornament. Use wire cutters to cut the berry stems in half. 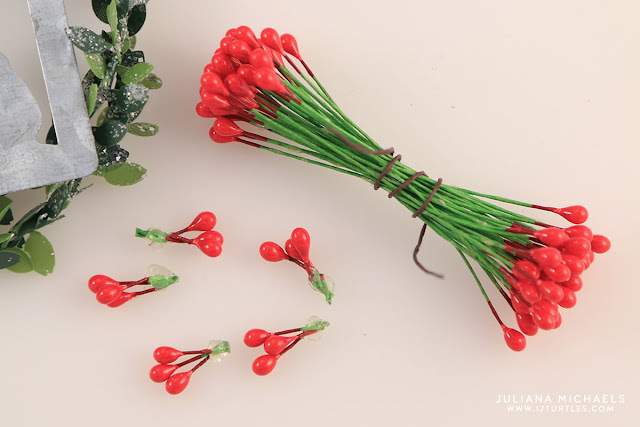 Take three of them, twist the ends together and add a dab of hot glue close toward the berries to help hold them together. Try to keep the stems short. Create five groups of berries. Adhere the berries to the wreath using hot glue. Once the wreath is complete, hot glue it to the wood plank. I really love how this gift turned out and so did my friends. The wood plank and galvanized metal really add to the farmhouse style of it. Of course, after I made them for my friends, I couldn't resist, but to make one for myself as well. Hello all! A couple of months back, I ordered some stamps from Honey Bee Stamps. 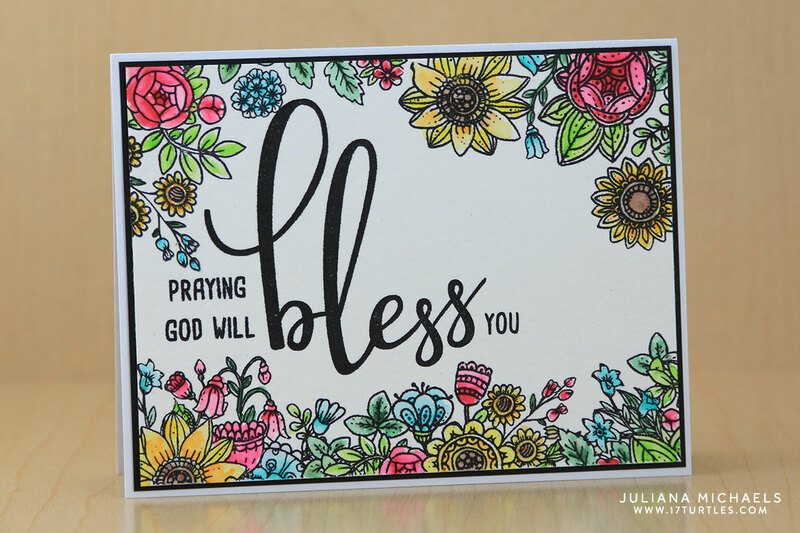 This was a new to me company, and they had just released some gorgeous new stamps that I wanted to use to create and some cards to a call for CardMaker Magazine. Well, I'm pleased to share that several cards using these stamps will be published in the upcoming Summer 2017 Issue of Cardmaker Magazine. Since getting the stamps, I haven't stopped playing with them. They have become one of my favorites because of the gorgeous floral designs and how they lend themselves so beautifully to coloring. While creating with these stamps, I decide to create 2 cards using the exact same design, but to use very different techniques and colors on each one to show just how different the same design can turn out by making such small changes. I laid out the design using my MISTI stamp tool to help determine the placement of the floral stamps and the sentiment. The bottom stamped image is the border stamp from the set. I didn't want to have the exact same image across the top, so I positioned the individual flowers to create my own border design for the top of the card. I then stamped the floral image using Versamark Embossing Ink and heat set it with white embossing powder. Next, I stamped the sentiment with black ink. Using my Zig Clean Color Real Brush Markers, I colored in the flowers using a mix of purples and blues. I used a small paint brush and water to help blend the colors. Using the exact same stamp layout, thanks to my MISTI, I stamped the same image using black ink. I then colored it in with a mix of primary colors using my Zig Clean Color Real Brush Markers. I love the striking difference between the two designs. One being more soft and delicate and the other being a bit more bold. Now it's your turn. I challenge you to give this technique a try and see just how differently the same design can turn out with your stamps. Are you interested in any of the products I used to create these cards? A full supply list can be found below. Where available, I use affiliate links. If you make a purchase after clicking, this means I'll receive a small commission at no extra cost to you. Thanks so much for your support! Hello everyone and welcome. 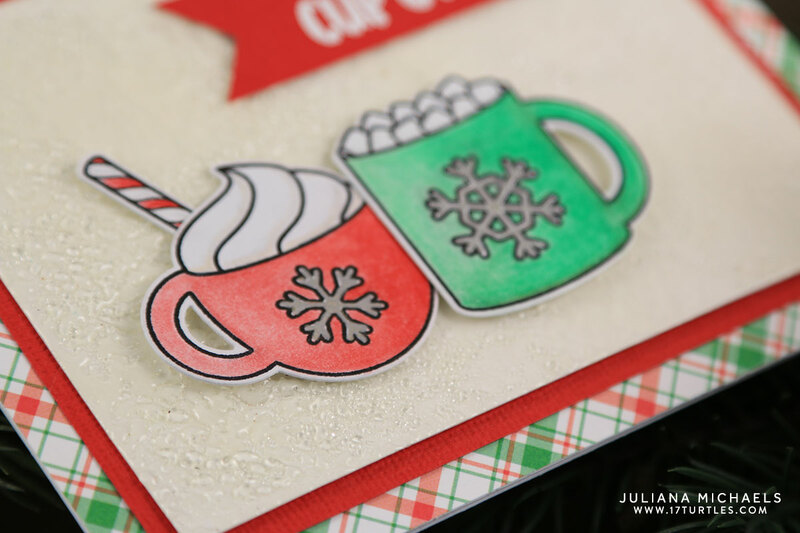 Today I'm sharing some Christmas card ideas using the Gina K Designs Home for the Holidays StampTV Kit as part of the Gina K Designs and Cardmaker Magazine Blog Hop. This is my first time creating with products from Gina K and I must say I absolutely love them! The Kit comes with 4 clear stamp sets, coordinating dies, a 6x6 patterned paper pack, and 24 sheets of cardstock. Other than ink, adhesive and envelopes, you have everything you need to create all your Christmas cards. However, what really made me smile with glee was that all of this comes in a fabulous plastic storage box - which totally makes this organization and storage lover super happy! I was immediately drawn to the adorable Santa and Snowman stamps in the Christmas Magic stamp set. I stamped, die cut and then colored them with my Prismacolor pencils. 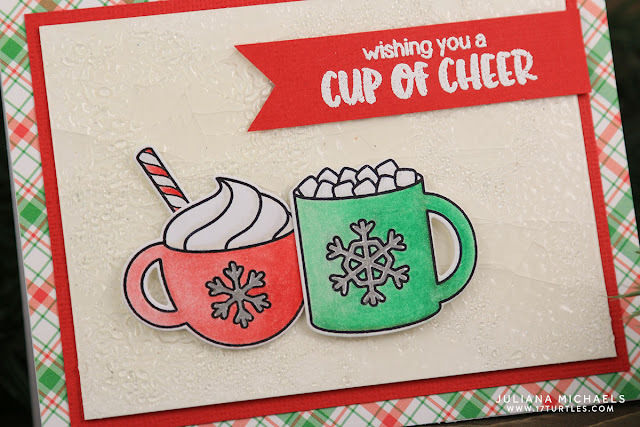 To create the snow hill, I used a fun technique for Faux Stitching that I learned from watching one of the fabulous StampTV videos. I then stamped the snowflakes onto a piece Turquoise Sea cardstock with Versamark. Once it was dry, I drew over them with a Stardust Gelly Roll Pen to add a touch of shine. I also stamped the sentiment with Versamark, but I heat embossed it with white embossing powder to help it stand out a bit more. I then adhered the die cuts onto the piece with double sided foam tape and attached it to the front of the card. On my second card, I went a little more simple and didn't do any coloring. 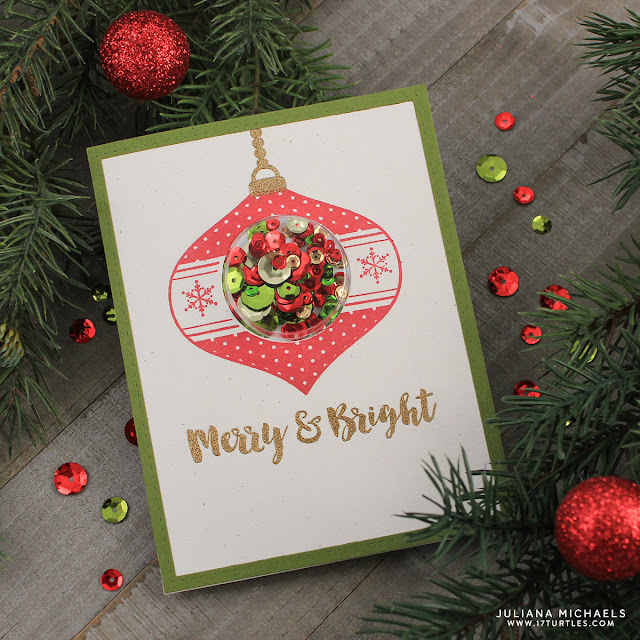 I used the Christmas Greenery Stamp set to create a festive background by stamping some of the flowers and leaves onto a piece of Ivory cardstock with various colors of ink. I then stamped the sentiment using Versamark Ink onto the Turquoise Sea cardstock and heat embossed it with white embossing powder. Christmas will be here before we know it and thanks to the Home for the Holidays Kit from Gina K Designs, I've got a great start on making my Christmas cards this year. And now for some awesomeness ... Gina K Designs is having a giveaway! Leave a comment on the Gina K blog for your chance to win a $25 gift certificate to their online store! The winner will be announced on their blog on Friday morning. Hello everyone and welcome! 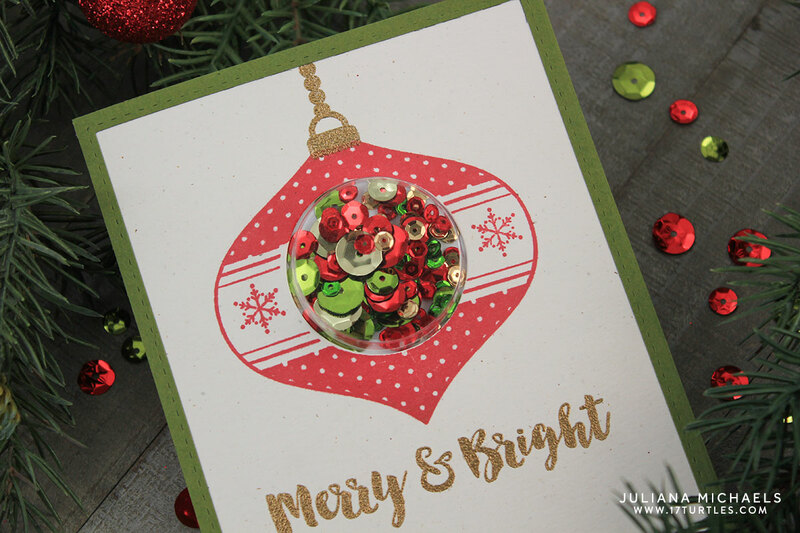 Today I'm sharing two festive Christmas shaker cards. 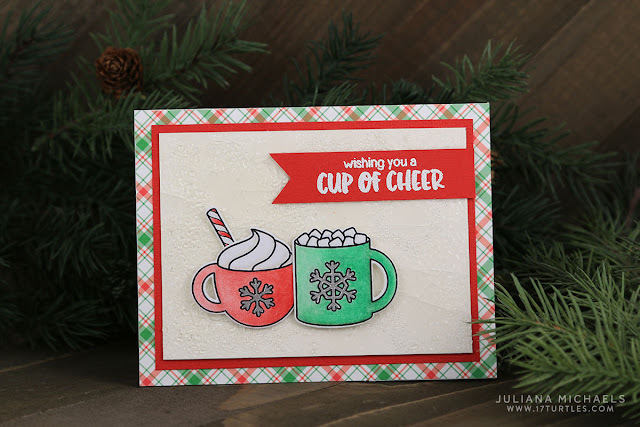 I created these cards for the CardMaker and Jillibean Soup Blog Hop using the new Holiday Shape Shakers by Jillibean Soup! You'll find all the blog hop details below. First, let me share a bit about these fun products. If you aren't familiar with Jillibean Soup Shape Shakers, let me tell you a little bit about them. 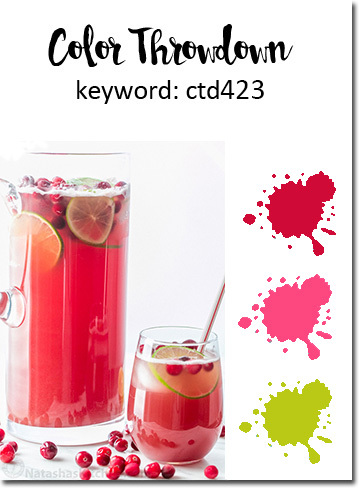 They are a super quick and easy way to make the popular shaker cards you are seeing all over the place these days. Most methods for making a shaker card can get a little confusing and time consuming. 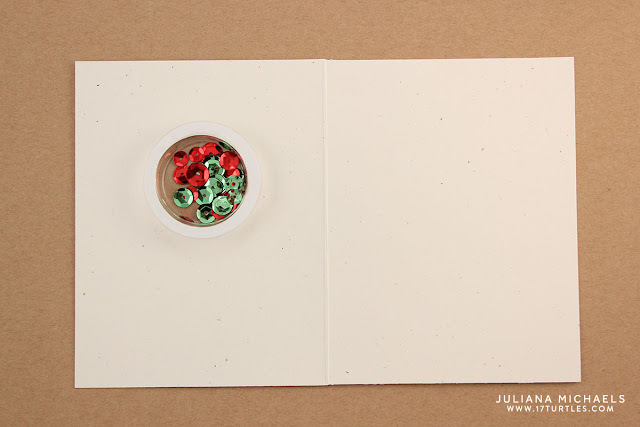 Jillibean Soup has taken all that stress away and turned them into a fun and easy project that anyone can create! Begin by selecting one of their die-cut card bases. They have several shapes that include a small circle, a large circle, a square, a jar, a cloud and a star. Each of these cards has an opening already cut into them. The cards also come with envelopes and they are sized to large enough to fit the shakers. For this card, I used the Small Circle Card Base. Next, select some stamps to decorate your card. On this card, I used the new Ornament Stamp Set which is made to work perfectly with Small Circle Card Base. I stamped the ornament using red ink and did some gold heat embossing when I stamped the hanger and sentiment. Next, select the coordinating Shape Shaker. 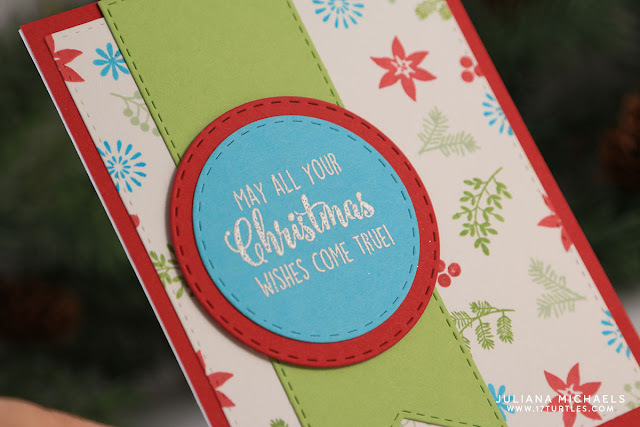 For this card, I used the Small Circle Shape Shaker. 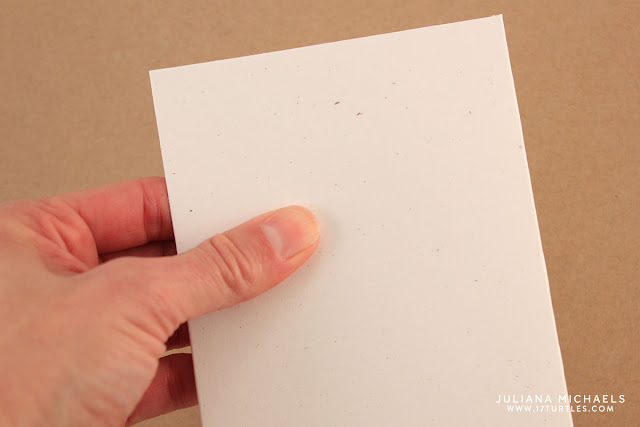 This is a plastic shape that has adhesive around the outside edge and it will become the shaker part of the card. Now the fun begins! 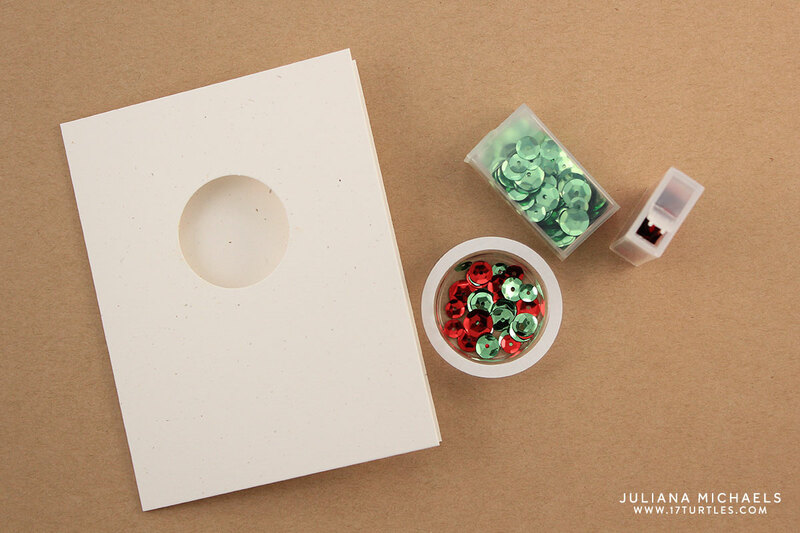 Fill the shaker with sequins, small beads, die cuts or even a stamped image. Designer Tip: Before you fill the shaker, rub it with a dryer sheet or cotton ball soaked with rubbing alcohol. This will help decrease the static when you add the sequins. Open the card all the way. Place the filled shaker into the opening on the card. Remove the adhesive backing, and carefully lift up the card and filled shaker. Carefully close the card by bringing the back side of the card toward the side with the filled shaker. Rub your fingers around the plastic shaker to adhere it the the card. Turn your card over and enjoy your festive holiday shaker card! There are so many fun ways to create and play with the Jillibean Shape Shakers. Here is another shaker card I created using their Jar Card Base, Jar Shape Shaker, and Jar Die Set. Instead of stamping on the card front, I used the Jar from the Jar Die Set to die cut a piece of patterned paper to fit the opening of the Jar Shape Shaker. To help me determine where to position the die, I used the card as a template. The stamps on this card are from the Snow Globe stamp set. I stamped the sentiment and image on the inside of the card. 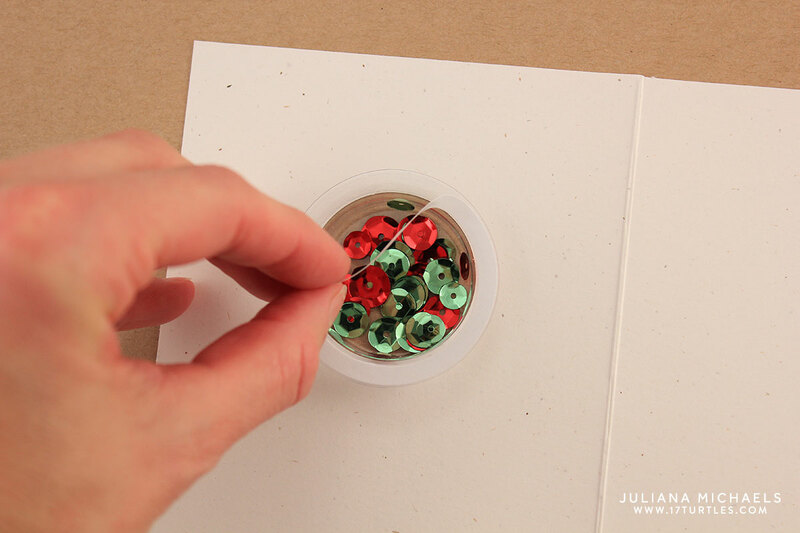 I then filled the shaker with sequins and adhered it to the card. For the final touch, I added a little jute bow. So, who is ready to start making one of these for all your family and friends this holiday season? And now for the good stuff...Jillibean Soup is having a giveaway! 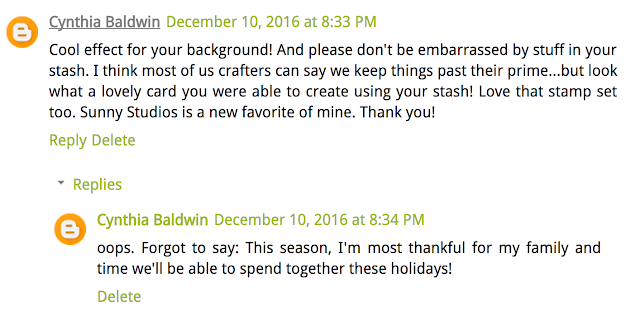 Make sure to leave a comment on each blog for your chance to win an awesome prize featuring some of their new Holiday Shape Shakers!